ALL Rottweiler females must have BRUCELOSIS TEST RESULTS NEGATIVE within 30 days before dog comes on property and before female is bred. NO EXCEPTIONS! Pease read our page on Brucellosis and why we are so strict. Large, strong, strong bone structure, very large head, correct ear position and well placed ears, dark eyes, well pronounced stop, straight front legs, good fore chest, good rear end angulations, excellent top line and underline, tail positioned well, correct markings, good coat, free movement, scissor bite. CRITIQUE: Carsten Henriksen - Middle sized, slim, very well built with good strength of bone, really good middle sized male head, good broad skull, high set well worn smalll ears, good expression, middle brown eyes, good muzzel, strong well muscled neck, sufficient for chest, strong short top line with good wither, good bottom line, sufficient depth of chest, middle strength of bone, well set and well angulated in front, well set and sufficiently angulated in back, rather active, very well fluid movement with correct length of step, nearly steady ack, very good middle length of fur, very warm colors, docked tail. Earl's owner would like to thank Joseph and Josephine Weber for importing beautiful dogs, to create a beautiful dog such as Earl. Earl has extremely similar characteristics as Graf von der Teufelsbrucke. we are a Rottweiler breeder located in Nashville Tennessee. We breed to the top Rottweiler stud dogs available. 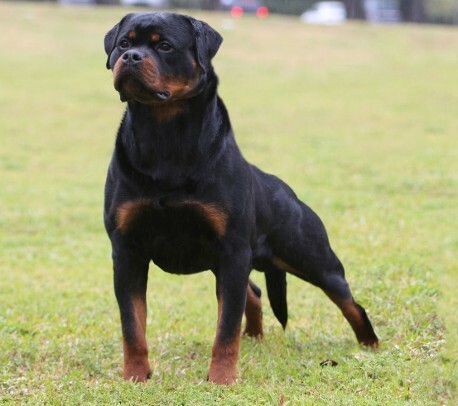 Some Rottweiler stud males are offered in various states and countries. The Rottweiler males are proven producers of excellent Rottweiler pups. We recommend other breeders for Rottweiler stud services. Please contact us, Von Der Musikstadt Rottweilers for some stud rottweiler references. We have a few good references. The Rottweiler males we suggest are listed below. Our Rottweiler stud dog service is by contract. 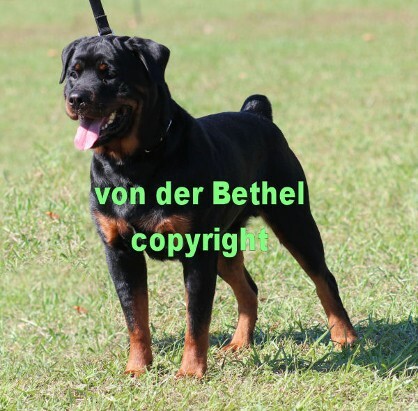 Our personal Rottweiler for stud is Able von der Siegbach. Below are also other top Rottweiler stud dogs that are not from our Rottweiler kennel.